Are you sure this isn't a Corona ad? Why hello there. Another game I can cross off my Pile of Shame, you say? Don't mind if I do! It's actually about time I crossed Battlefield 1 off the list considering its sequel Battlefield V (yes, the numbering is a bit confusing) is being released in a couple of months. I did participate in the BF1 beta and dabbled around with it a little bit when it was first released but Rainbow Six: Siege proved to be a major distraction and I never got around to completing the single-player campaign or playing the multiplayer much again, until recently. Overall, I enjoyed the single-player campaign especially the codex entries that give you facts about World War I. Since I completed most of the single-player campaign in about 4 hours, I'm guessing in total the single-player campaign probably takes 5-6 hours, which is probably par for the course for AAA FPSs. I also really enjoy the soundtrack since I have a soft spot for the Battlefield theme and it's even better returning to its roots: i.e. played by an orchestra! Despite the War Stories being based on actual conflicts, I found some of the scenes a bit far-fetched, such as the mission where you're clad in platemail, armed with a machine gun, and taking on the might of the Austro-Hungarian empire – just a bit romanticised methinks. The AI, super enemies and level design are aspects I also dislike, but hey at least the game looks pretty. Oh, and cutscenes are horrendously slow in terms of framerate – I don't know what's up with that. So, I just finished raiding a sugar plantation and ended up assassinating almost every guard on it before I had a clean shot at looting the warehouse. I didn't realise you could sabotage the alarms so that'll be something to keep in mind for next time. Next mission appears to be stealing a Spanish Galleon. 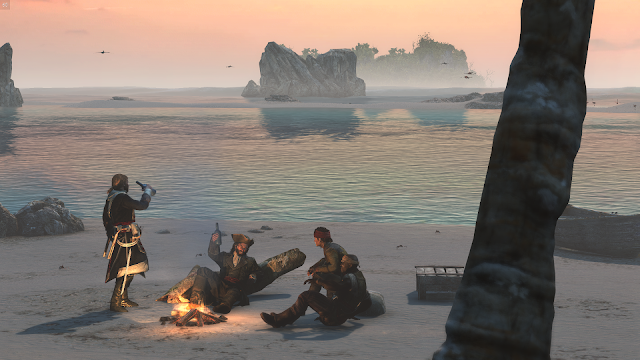 I'm loving some of the game's cutscenes, they can be quite pretty despite the engine being a few years old now: one of the most recent cutscenes I experienced looks like it's straight out of a Corona commercial, just a bunch of mates, sitting on a Caribbean beach, enjoying some drinks as the sun sets. Doesn't feel like I'm close to finishing the game so my "percentage complete" might be a bit off, but only one way to find out, hey? I completed a long mission that took almost an hour which involved hacking into a Neopets server (and I only just discovered that Neopets is an actual thing – I've obviously been living under a rock all these years): the mission involved investigating developer PCs which were acquired by hacking into a Git Repository and recording their IP addresses. Eventually you gather enough login information lying around to access the mainframe. I do love the developer humour in this game, such as reading about some guy who now feels smart because he found some "regex on Stack Exchange": there's only 10 types of people in the world and only one of those groups will get it. Unfortunately, the game does annoy me at times, like the time I had to hack into an eOS phone and I forgot the default login details (and it's not recorded anywhere in Hacknet Labyrinths, at least if I recall correctly) – this meant having to do a Google search to find the answer, which is not an arduous task, but it felt a bit like cheating. Anyway, I've rectified this by editing a txt file in the game to include this password.